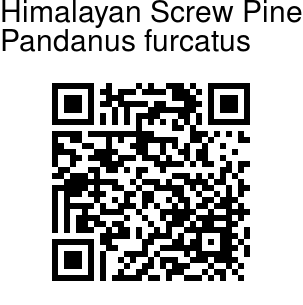 Himalayan Screw Pine is a tree found in the Himalayas, with stems 3-17 m tall. Branched aerial roots arise from the lower trunk. Long leaves are dark green, 3-5 m long and 10 cm broad, with sharp curved prickles on the margin and the midrib. Flower spathes are several, leathery, golden yellow, the lowest up to 1 m long. Fruit is a compound cone-like fruit made of several drupes, orange-red when ripe, 15-25 cm long. Drupes are feshy, 5-6 angled. 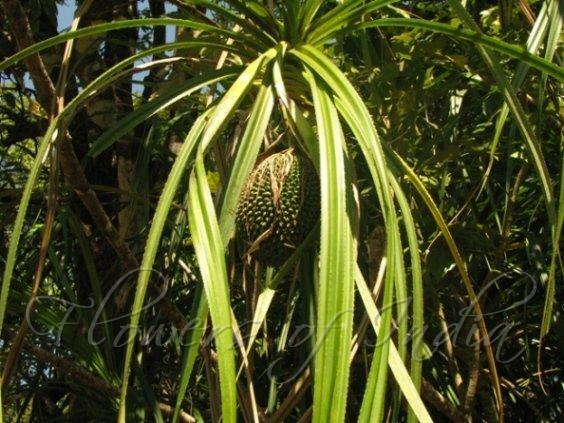 Nepal Screwpine is found in Nepal and Sikkim, at altitudes of 700-1000 m. In Sikkim, the flowers of Himalayan Screwpine are worn by girls in their hair to win their lovers. It is said to aphrosidiac and induces sleep.